. Takadono tatara 高殿鑪 たかどのたたら . Kanayago-kami (the deity Kanayago) is enshrined at tatara in the Chugoku mountains. 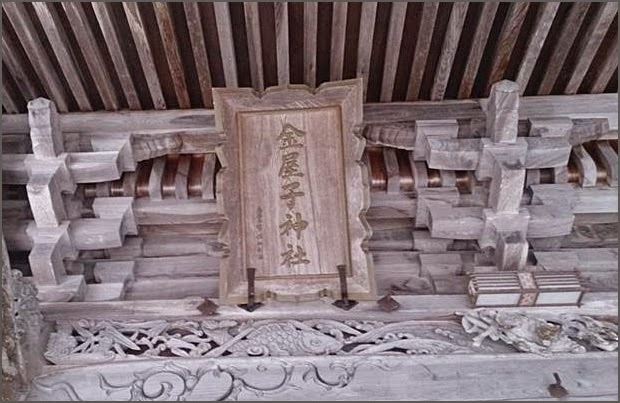 While the main shrine dedicated to this deity (whose name is written with characters that literally mean “child of the metal worker") is located at Nishihida in the city of Yasugi, Shimane Prefecture. Devotion to Kanayago-kami is widespread, centered on the Chugoku region but extending from Kyushu and parts of Shikoku to the distant Kanto region and parts of Tohoku. The ritual deities celebrated at present are Kanayama-hiko-no-mikoto and Kanayama-hime-no-mikoto with origins in the Yamato line (see section 2.1.3 for background), but originally it was Kanayago-kami, more familiarly called “Kanayago-san” throughout the region. Worship of Kanayama-hiko and Kanayama-hime (male and female, respectively) dates almost certainly to early modern times. This is believed to have been aimed at increasing the authority of the shrines. So saying, she climbed on a white heron to travel to the mountains of Okuhida in Kurota in Nogi County of the province of Izumo (around Nishihida in Shimane Prefecture). The heron alit upon on a katsura tree to rest, and Kanayago-kami then taught the technique of making iron in that region to the members of the Abe clan." 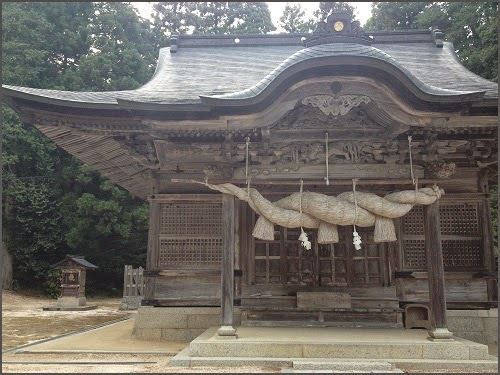 Since then, Kanayago-kami has continued to be worshipped by the descendents of the Abe clan. The Abe clan involved itself not only with priestly affairs, but also with traveling around to instruct others in tatara techniques. There are a variety of curious taboos associated with Kanayago-kami. Kanayago-kami hates dogs, ivy, and hemp. 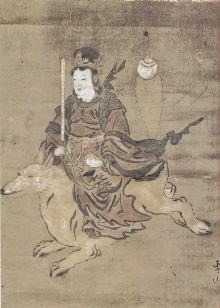 According to the legend in Hino County, Tottori Prefecture, a dog howled at Kanayago-kami when she descended from the heavens. The deity tried to escape by climbing a vine, but the vine broke. She was attacked by the dog and died as a result. The version of the story told in I'ishi County, Shimane Prefecture, is that, rather than ivy, she became entangled in hemp or flax and died. The legend in Nita County, Shimane Prefecture, holds that the ivy did indeed break, but she then grabbed onto a wisteria tree and was saved. She may be a deity, but in this humorous story she is a rather human character. Such legends are the reason why dogs are not allowed near tatara and hemp is not used for any tatara tools or equipment. Also, katsura trees are not burned in tatara because they are regarded as divine. Kanayago-kami is a female deity so she hates women. A murage 村下 (a chief engineer in metal forging) will not enter the tatara when his wife is menstruating. He shuts down his tatara temporarily just before and after his wife gives birth. If work is at a point that he cannot put it aside, it is said that he will not go home nor look at the face of his newly born child. It is also said that murage are especially strict about not getting into a bath if a woman has used it. The disciples of Kanayago-kami did not know what to do with their tatara when she died so suddenly. It is said that just as they were praying to and beseeching her for help, just when the iron could not be brought to birth no matter what they did, they received an oracle calling for them either to stand a dead body up against the tatara's four supporting pillars (Nita County) or bind the bones of a murage to the four pillars (the village of Yoshida, Shimane Prefecture). There similarly appears to have been no taboos about death in tatara in other locales, either. They apparently made coffins in tatara when a person died in Aki or Yamagata in Hiroshima Prefecture, while in Futami county in the old Bingo province (around Hiroshima today) people would carry a coffin around the tatara when holding a funeral. Details about Kanayago-kami turn up in various stories, including those related to such other deities as Yawata-kami, Ama-no-hiboko, Takuso-susano-no-mikoto, and Kanayama-hiko-no-mikoto. In all cases, Kanayago-kami was the patron deity of blacksmiths, worshipped from the start by people involved in metalwork. These artisans spread devotion to Kanayago to many locations, and the present form of that worship was probably created by the Abe clan. Festivals are held at the shrine Kanayago-jinja in the spring around the middle of the 3rd month and in the autumn early in the 10th month, the dates being determined according to the Chinese zodiacal calendar. In the past, the Kanayago festival at Hida was an event to which tatara masters and blacksmiths would come from distant provinces, as well as from Izumo and the neighboring province of Hoki. According to Kojiki, these kami were produced from the vomit (taguri) emitted by Izanami as she lay dying following the birth of the kami of fire Kagutsuchi. 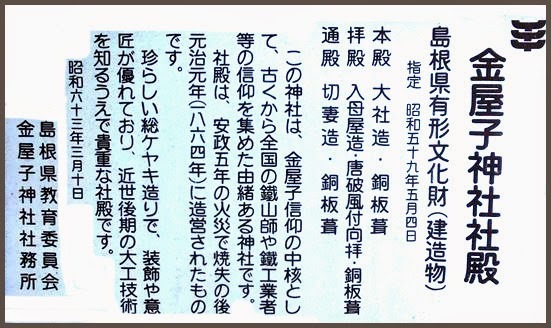 An "alternate writing" relating the same event in Nihongi mentions only the kami Kanayamabiko. Both kami are considered tutelaries of mines, metals, and the techniques associated with them. They are enshrined at the Nangū Taisha (Nangu Taisha) in Fuwa District, Gifu Prefecture, as well as at numerous Kanayama and other shrines throughout the country. The clear water and wind down from Ibukiyama was suited for the metal forging craftsmen. Tatara was likely imported into Japan from Korea by way of Shimane Prefecture, and seeing as the San’in region is rich with titanium magnetite, a necessary ingrediant for iron production, it took hold here very early on in Japanese history. Way back in ancient Japan–specifically 713ad, two years after the compilation of the Kojiki (originally ordered by Emperor Temmu) was completed, Empress Gemmei ordered the compliation of the Fudoki. 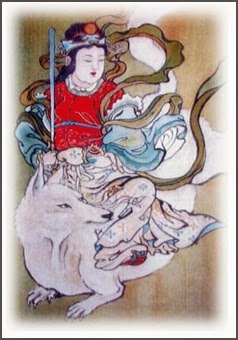 While the Kojiki is like a history book (which we would now consider a book of Shinto mythology), the Fudoki were like encyclopedia, conducted in each province to chronicle geography, plant and animal species, the lifestyles of the people, and significant historical events (many of which we would now refer to as myths). Most of the Fudoki no longer exist, but the Izumo-no-Kuni-Fudoki remains mostly in tact. Therefore, we know a lot more about life in 8th century Izumo than about any other part of Japan. It includes many details about tatara. ..... There is a patron god of Tatara, though many of the popular local myths say she is a goddess. This is Kanayago, the kami that is revered throughout Japan for teaching craftsmen how to making iron. Having particular influence over Western Japan, she wanted to settle in the mountains there, so she descended upon a particular spot in southwestern Yasugi where a heron perched upon a katsura tree, a very brief hike up the hill from Kanayago-jinja, the head shrine of all Kanayago shrines. ... As numerous as Kanayago shrines are (especially in the Chugoku region), many of them make donations to this head shrine. A short walk across from the entrance to the shrine is the folk tradition hall dedicated to the shrine and legends about Kanayago. It’s small, but well designed and with lots of information and 3D displays. ..... if you’re a fan of Hayao Miyazaki and Ghibli studio movies, then you likely are already familiar with tatara after all. Iron Town in the 1997 film Princess Mononoke was based on Okuizumo (not to be confused with Higashiizumo)!
. 出雲風土記 Izumo Fudoki . This deity dislikes anything connected to giving birth. Therefore after a birth a woman is not allowed to come near the Tatara 鑪. Even now she is not allowed to come near a charcoal kiln.
. Takadono tatara 高殿鑪 hut for working with metal . Kanayago is 炭焼きの神・火の神・鉄山の神 the deity venerated by charcoal makers, protecting from fire and in mines. she is venerate way back in the valley of Ibaradani 井原谷.